Summer offers an infinite variety of offshore fishing opportunities. Everything from sea bass on the reefs to blue marlin in the Gulf Stream is biting. Many of the bluewater fish that occur 50 miles offshore in the early spring may move to within 15 miles of the coast. Summer also offers the angler the best weather of the year, sometimes with four or five consecutive days of flat, calm conditions. Summer fishing has its drawbacks, though. The steamy hot days of July and August send many of the fish that normally inhabit the surface to deeper waters. Summer heat also polarizes much of the feeding activity into the early morning and late afternoon and evening. During the hot part of the day, the wise fisherman sets his baits deep to catch the same fish that were on the surface in the morning. Downriggers and planers are key elements to a successful offshore trip during the summer. Blue and white marlin become more scattered during this time since temperature no longer restricts them to the Gulf Stream. Occasionally, a marlin will surprise a king mackerel fisherman in 80 feet of water, but the most productive area will be in 300 to 1200 feet of water. Sailfish reach peak abundance during the summer. July and August offer anglers their best opportunity to catch sails off South Carolina. During this time, numerous small sails will be hooked within 10 miles of the beach, but these fish are usually well below the 57-inch fork length minimum set by law. Weed lines, current rips and natural reefs in 120 to 300 feet of water are the best areas for these prized game fish. Averaging 35 to 45 pounds, sails pre-fer smaller baits than their larger cousins the marlins. Trolling with small to medium size ballyhoo and mullet with a small artificial lure or colored skirt placed ahead of the bait is effective for sailfish. Sails will readily attack small to medium-sized lures and have even been caught on spoons and plugs intended for king mackerel. During the summer, many blue marlin in local waters are in the 125- to 200-pound range which is below the 86-inch fork length minimum. Large mullet, ballyhoo, ladyfish and Spanish mackerel rigged to skip across the surface or to swim are popular and effective baits. These are frequently dressed up with brightly colored plastic skirts and artificial lures. Large, 10- to 16-inch long, brightly colored artificial lures are also very effective for marlin. Natural baits offer real food so that if a fish strikes short it will more than likely return to the bait. This is less likely to happen with artificial lures. Artificials on the other hand can be trolled faster allowing more area to be fished and do not require the extensive time necessary to rig natural baits. Summer offers anglers an excellent opportunity to catch these game fish closer to shore than during any other season. Good concentrations of yellowfin tuna, wahoo and dolphin occur as close in as 90 feet of water, although the area from 180 feet deep to 600 feet deep will hold the best concentrations of these species. As summer progresses, the size of both dolphin and wahoo gradually declines. At summer's start, 10- to 20-pound dolphin and 35- to 50-pound wahoo are the norm but average weight drops to 8 pounds for dolphin and 20 pounds for wahoo by summer's end. Conversely, yellowfin tuna increase in size throughout the year, averaging 45 pounds by late summer. Natural baits such as ballyhoo or mullet rigged with a small to medium sized artificial lure or colored skirt produce more of these game fish than any other baits. Large artificial surface lures are also effective for the big fish. While all baits are usually fished on the surface from outriggers, it is wise to run at least one line 60 to 70 feet deep via a downrigger. Amberjack and barracuda provide some of the most action-packed fishing on artificial reefs and coastal shipwrecks during this time of year. During the summer these fish can be notoriously picky but live bait can remedy the problem. Summer offers anglers the opportunity to test not only their equipment but their angling skills as well. Most anglers choose to approach amberjack, which run 25 to 60 pounds, with a 50-pound class outfit. However, challenging these fish on 30 or even 20-pound test line can be a thrilling experience. Barracuda usually run much smaller than the AJ's, averaging 10 to 15 pounds; however, barracuda of 30 to 40 pounds are regularly encountered. Light tackle in the 12- to 20-pound test range is ideal. Wire leader is mandatory for cudas whose teeth are razor sharp while heavy, 100- to 150-pound test, monofilament works good for the jacks. Large live baits such as 8- to 14-inch mullet and menhaden either floated at the surface over the shipwrecks or free lined (no weight or float) down current to the structure are deadly techniques. Depending on the line test used, a 5/0 to 8/0 extra strength hook should be used. A stainless steel hook is recommended since most fish are released and not eaten. Artificial lures also can be effective for both amberjack and barracuda. The surgical rubber tube lure (Cuda Killer), in dark green, chartreuse and hot pink is very effective either trolled or cast. Amberjacks prefer deep diving plugs and spoons trolled deep. Noisy surface lures however, will excite both into striking. King fishing during the summer has its up and downs. It seems to turn on and off every two to three weeks. The larger female fish (20 to 40 pounds) normally occur in the nearshore waters just outside bays and sounds. Smaller males (6 to 12 pounds) are abundant in 60 to 120 feet of water. Artificial and natural reefs are focal points for these schooling fish. During the early morning hours, baits trolled on the surface are extremely productive. By 10 a.m., however, the fish usually sound to avoid the heat. This is when the smart angler brings out the downriggers and planers. When fishing these deep running devices, remember to keep the bait or lure at least 10 feet behind the device. Kings can be finicky at this time of year, subsequently anglers try everything from artificial lures to that offshore panacea, rigged ballyhoo. Live bait, such as 6- to 10-inch long mullet or menhaden, slow trolled or drifted can also be extremely effective. These should be fished at various depths using a live bait rig to locate the fish. Spoons and deep running plugs also work well. Colored plastic skirts, Hawaiian eyes, and seawitches are normally used to dress up ballyhoo for trolling. Like live baits, these lures are fished at various depths to find the fish. Little tunny and Spanish mackerel often are abundant in the near shore waters out to 15 miles during this period. Like little tunny (locally called bonito), crevalle jack are considered great game fish but are not highly esteemed as food. Tunny usually average around 10 pounds, crevalles about 5 pounds in size. Schools of surface feeding fish can be spotted by the wheeling and diving terns feeding on the bait fish pushed to the surface by the hungry fish. These schools are usually either tunny, crevalles, or Spanish but occasionally will be mixed. One to 5 miles outside the mouths of bays and sounds and around artificial reefs are prime areas for schooling activity. Small silver or gold spoons 2 to 3 inches in length such as Hopkins, Clark, Captain Action and Tony Accetta are the most productive. Most anglers prefer to fish these on a 20-inch, 60-pound test wire leader to prevent cut-offs. When fish become picky, switch to a 30-pound mono leader. A 1/2- to 1 1/2-ounce swivel lead should be placed 2 to 3 feet ahead of the spoon to allow longer casts and to keep the spoon below the surface. These fish are extremely fast, subsequently you must retrieve a lure as fast as possible and troll at a fast pace. A small planer should be used to locate the depth of the fish. The spoon or plug should always be at least 10 feet behind the planer. Plugs, especially deep diving ones, are effective in catching the larger fish lurking below the surface feeding fish. Bottom fishing off our coast is also affected by the heat of summer. Sea bass as well as porgies, snappers and other reef fish will scatter, taking up residence on the small parcels of reef or live bottom habitat. This creates more fishable areas but usually much smaller schools. These deepwater fishes usually slow their feeding activity during the middle part of the day. Bottom fishermen frequently make over-night trips so they can fish from late evening through the night and into the early morning hours. Concentrations of black sea bass (blackfish), which average 1 to 2 pounds, occur in 40 to 120 feet of water. The best fishing, however, is usually on ledges and live bottom areas in 50 to 70 feet of water. Blackfish stay in close proximity to structure so it is crucial to anchor directly over the reef, or to re-start your drifts as soon as the fish quit biting. Few fish are more aggressive feeders than sea bass. The preferred bait is cut squid because it is tough and well liked by the fish. A two-hook bottom rig with 3/0 to 5/0 hooks and a 6- to 12- ounce sinker is normally used. stray little from the protection of the reefs. Other than grouper, most reef fish run 1 to 4 pounds in size but will range up to 8 to 15 pounds. Groupers average 5 to 10 pounds, ranging up to 40 pounds. Warsaw grouper may exceed 300 pounds. Cut squid is the best bait. Cigar minnows and sardines are preferred for red snapper and are also effective on grouper. Live or cut vermilion snapper are excellent for grouper. Cigar minnows and live bait should be fished from just off the bottom to 10 feet above the bottom. The positive impact of tag and release has been demonstrated dramatically by the Governor's Cup Billfishing Series. Begun in 1989, this annual event, encompassing the major spring billfishing tournaments, has resulted in a new conservation emphasis among offshore anglers. Now, more than 85 percent of billfish brought to the boat are tagged and released by both tournament and nontournament anglers. 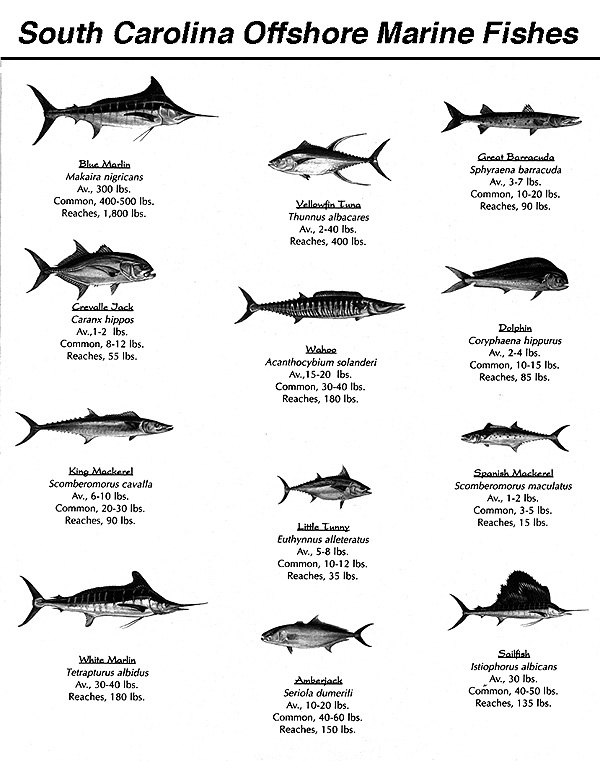 Catches of blue marlin, white marlin and sailfish have increased each year as a result. Saltwater fishermen can further contribute to conservation by purchasing a Marine Recreational Fisheries Stamp (Adobe PDF) which is required to fish from a private boat or to gather shellfish in South Carolina's saltwaters. Funds generated by the sale of stamps must be spent on programs that directly benefit saltwater fish and fishermen.